With the Disney Social Media Moms Celebration approaching, I’m going to soon face one of my biggest fears. No, I don’t mean the Wild Africa Trek’s rickety bridge over the crocodiles (though that’s sure to trigger a big fear too). This is the fear of socializing. You see, I might seem like quite the extrovert online, but put me in a room full of people, especially people that I haven’t known face-to-face for awhile, and I become a huge introvert. The idea of approaching someone I don’t know and talking to them terrifies me. The possibility that I’ll "introduce" myself only to find out that we’ve met in person before fills me with paralyzing panic. I’m much more comfortable in the online arena where I can more easily remember if I’ve conversed with a certain user before and take my time to craft my response for maximum wittiness. In many ways, my "online persona" is closer to the real me than my "in-person persona." I suspect that I’m more extroverted in public than I give myself credit for. While I’ll often feel like the socially stunted high school kid I used to be when dropped into a social situation, I try to keep reminding myself that I’ve grown so much since then. I’ve attended two Disney Social Media Moms Celebrations already (albeit as B’s guest), I attended BlogHer in 2010, and I’ve been in many social situations at work where I spoke with people I didn’t know well. I tell myself that my fears are unfounded, but they still dog me. However, I’m a big advocate of facing down your fears. 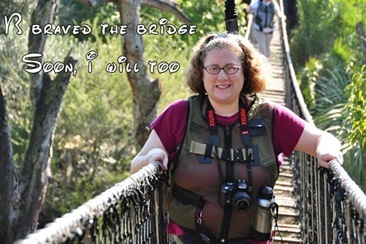 I might have a fear of falling, but I’m not going to let that stop me from walking across the bridge on the Wild Africa Trek. Neither will I let my fear of social situations stop me from talking to people at the Disney Social Media Moms Celebration. Just do me a favor and be patient with me if I introduce myself and we met before, ok? 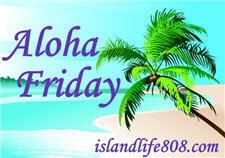 My Aloha Friday questions for today are: Are you an introvert or extrovert in person? How do you face down your fears? I guess I’m more of an extrovert but I think I’ve gotten better as I get older. Kari recently posted..I Think I’m Finally Cutting The Cord. A Little Bit. I’m an introvert. I also have Social Anxiety disorder, which I probaly WHY I’m an introvert. I’m okay online, but face to face I can be a nervous wreck, and have a panic attack doing something as simple as going to the doctor by myself.